A proven, heavy duty bag closing system that instantly seals pre-glued,multi wall paper bags. Fischbein’s Model 5600 Pinch Bag Closer is a proven, heavy duty bag closing system that instantly seals pre-glued,multi wall paper bags. Mounted on a rugged, portable pedestal, it is designed for efficient, inexpensive operation in a heavy duty production line. It’s compact size takes up a minimum of floor space. The PBC-5600 is fully adjustable, allowing for various bag sizes. 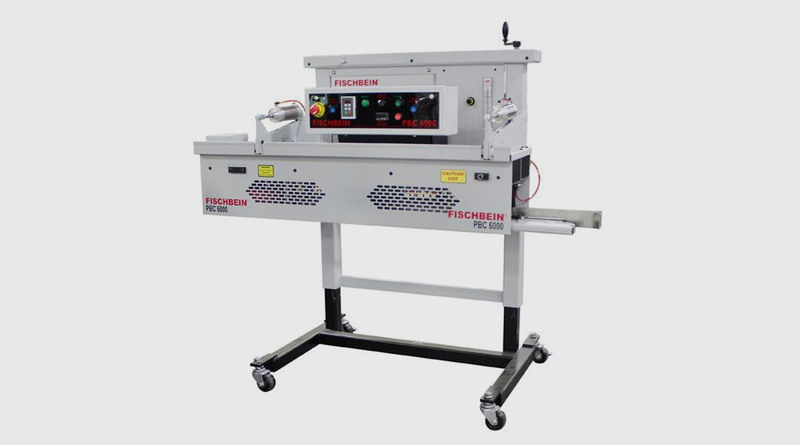 This machine allows for various bag sizes,conveyor speeds and heights. A unique design also incorporates a high efficiency heater manifold that decreases heat loss. With these features, the PBC-5600 design yields higher production and greater cost-efficiency. Features our patented Breakaway design for easy opening and immediate access to bag jams. Power Supply: 230 VAC, single phase50/60hz. Gusset: any size incl. flat bags.